The best inflatable Kayak will allow you to take part in a great low-impact activity that improves your overall fitness and gives you the chance to explore stunning environments at the same time. With the ability to paddle on rivers, lakes and oceans, kayaking is a truly versatile sport. In this article we will be looking at the different products that are available, and show you inflatable kayak reviews of the top products available. 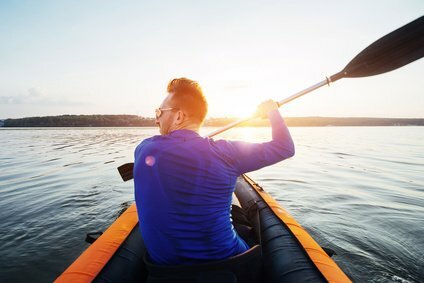 If you have decided that kayaking is for you and want to get your own kayak to go on the water with, there are a few things you must take into consideration before making your purchase. Kayaks can be made from a variety of materials, each of which come with their own positives and negatives. Most modern day ones are formed with polyethylene, vinyl, thermoformed plastic, or a composite involving fiberglass, Kevlar or carbon. There is a trade off with each of these. Lighter models made from plastics, Kevlar and carbon mean you will be faster in the water, are easier to control, and are a lot simpler to transport and take with you. Stiffer models made from plastic or carbon can be molded into better shapes and don’t flex as much, so are more efficient with the energy that you put into the water, are more resistant to knocks, and have longer lifespans. ​What’s so Special about an Air Kayak? Inflatable Kayaks are usually made from polyethylene or vinyl, and are by far the most convenient of the different varieties. They are easily transportable with their low weight and ability to be folded up, are ready to use in minutes, and are ideal for recreational paddling. They are not, however, as suited to paddling in tricky conditions, particularly choppy water, and are not as streamline as the more rigid designs so aren’t recommended for competitive racing. Kayaks come in different designs that affect your overall position with them, and your choice will just come down to personal preference. The hull shape has a massive impact on how stable you will feel; a larger surface area against the water will feel much more steady when in a normal position, and also improves how the kayak will respond if you need to lean out to one side. There are two different ways that you will sit within the kayak. Sit-on-top kayaks, for example, are a good choice for you if you have concerns about getting in and out of a closed shell or feel claustrophobic. They are also better for warmer environments, but risk more water getting in. Alternatively you can get a more traditional sit inside kayak. With one of these there is less of a chance of water getting into the cockpit, and they are easier to control as you paddle. It’s really important that you consider the types of environment you plan on visiting with your new kayak. Most inflatable kayaks are great for the gentle waters you get on rivers and lakes and also on calm ocean water, but are not so suited to more intense locations like whitewater rapids or turbulent seas. Some models are available that are specifically designed for these scenarios, though, so if you plan on paddling into more tricky situations it is vital that you get a kayak with bailing features so you can get rid of water without any difficulties. How Many People will be Paddling? When choosing a kayak you must think about the size and weight of the people that will be using it. It’s important that there is enough room for you to fit into it, and the space for your arms to freely be able to paddle. You must also consider the amount of equipment you plan on taking with you. Again, this requires you to think about how you will be using your kayak. Different models will offer differing amounts of storage space; either with extra capacity within the kayak or the inclusion of cargo netting to allow you to take all of your gear with you. Inflatable Kayaks are designed for recreational use, so are very stable and comfortable compared to other products. Most will have backrests to fully support you as you paddle, and some even have adjustable seats to ensure you are comfortable. This increased stability also means inflatable kayaks are ideal for fishing, photography, taking your dog for a swim, or as a platform for swimming. There are kayaks that are ﻿designed especially for fishing if this is your main activity. Some inflatable Kayaks have features that further improve the stability and control that you get. A tracking fin on the underside will help it to track better and follow the direction your are steering in more effectively, and the pressure you are able to inflate it to can have a major impact on how sturdy the experience will be. This two person Kayak from Intex is a great choice for you if you are looking for an easy to use product to quickly get out onto the water. Within the package you will get everything you need to start paddling; including paddles, a high-output pump, and a patch repair kit just in case any damage occurs. This kayak is 11ft 6inches long and 2ft 6 inches wide when fully inflated, but folds up into a much smaller space, so is easily portable. This inflatable tandem kayak from Intex has been designed to be fun and stable, and is ideal for you if you are looking for a product for trips to the lake. 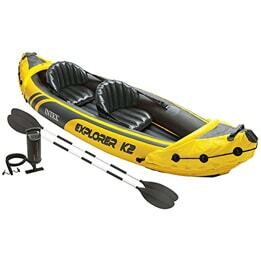 Included within the purchase are a set of aluminum oars and a high-powered pump, so you’ll be ready to go as soon as you receive it. The seats of this kayak are surprisingly comfortable and are fully adjustable to accommodate any body shape. They are also removable, so you can convert this kayak into a one-seat version with extra storage space. The floor provides rigidity, so you will feel safe and stable on the water, and the whole thing is incredibly lightweight so you’ll have no problems carrying it to where you need, even when it’s fully inflated. At just over 10 feet long and 3 feet wide, there is plenty of room in this kayak for two adults, with a maximum weight capacity of 400 pounds. It comes with a removable skeg to improve directional control, and grab lines and handles at each end. The bright yellow color is a nice addition, particularly in emergencies, because it means you will easily be seen when out on the water. This one seat kayak from Intex provides all you need to get out and paddle on the lake. 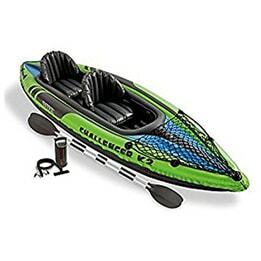 Within the package you will receive a set of aluminum paddles and a high-powered pump that will inflate it in three minutes so you can get going as soon as it arrives. The cockpit has been designed to allow most people to fit in with plenty of room, and the inflatable seat with backrest ensure you will feel comfortable and stable while you paddle. The kayak is 9 feet in length and 2foot 6 inches wide, with a maximum weight capacity of 220 pounds. With a total weight of 27.2 pounds, this product is very easy to transport to where you want to use it, and its lightweight design means it is much more responsive to steering than the two seat version. The removable skeg helps to give better control over steering, and the durable material that this kayak is made from means you won’t be concerned about scraping underwater rocks in shallower areas. It comes with a repair kit, though, so even if any problems do arise you’ll be able to easily fix them on location. This single seat kayak from Sevylor is lightweight and compact, and has been designed to be as convenient as possible. Everything fits inside the backpack, which turns into the seat once the kayak has been inflated. The full setup takes only around 5 minutes so more of your time can be spent on the lake. 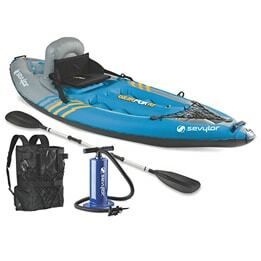 Within the package you get everything you need to get out on the lake, with a good set of paddles and a hand pump. 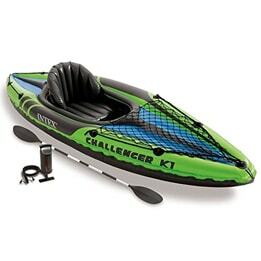 Like this model, the best inflatable kayak is fast to set up and durable at the same time. The Airtight system is guaranteed to not leak, but just in case you encounter any difficulties this kayak is built with multiple air chambers so if one is punctured it won’t jeopardize the structural integrity. The storage area is great, with plenty of room for all of your gear that can be secured by bungees, as well as cargo netting on the front for anything extra. When inflated it is 8 feet 7 inches long and 3 feet wide, with a maximum capacity of 400 pounds. To further enhance comfort, this kayak comes with an adjustable footrest, and cushioned backrest, and even a cup holder so your drink will always be close to hand. 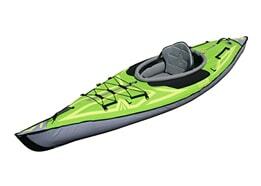 This 1 seat kayak from Advanced Elements is a very well designed product that is suitable for the serious enthusiast. Unlike other inflatable kayaks, this one has aluminum ribs that add extra definition to the bow and the stern, which results in much better control and durability. This structure means that it more resembles a hard-shelled kayak as opposed to an inflatable one, while still being lightweight and easily portable. The storage space within this kayak is impressive and allows you to take all the gear you need with you on your trip. The padded seat is fully adjustable to allow you to sit in the perfect position, and the durable materials that it is made from mean that you won’t need to be as conscious of hidden rocks causing damage. The rigid structure allows it to glide through the water, with the stern acting as a skeg. This would be a good option to consider if you are looking for a high-end product, but you should be aware that it doesn’t include a pump or paddles like many others do. Kayaking is a really fun activity that allows you to explore lakes and rivers from a different perspective, as well as a great opportunity to get outdoors and exercise. The best inflatable kayak is lightweight and portable, so you can take it with you wherever you need without sacrificing too much stability or control.